Following 2cc (0.3 pv) flood of brine. One of the best methods for the characterization of pore networks and their interaction with fluids is performing an NMR flow study. These studies involve using a pressurized vessel within the NMR or MRI instrument to flow fluid at pressure through the core sample while scanning the core with the instrument. The scans provide images of the fluid flowing through the core and can provide a lot of information about wettability, pore throat size, pore volumes, relative permeability, and saturation. 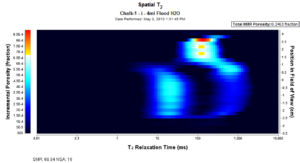 Flow studies are a key measurement technique for those researching and performing enhanced oil recovery (EOR) studies. Following 4cc (0.6 bpv) flood of brine. 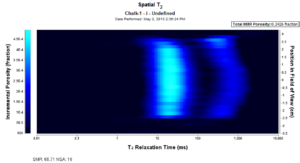 The P5 cell for Overburden Studies provides GeoSpec Rock Core Analyzer customers with an easy to implement a method to perform NMR flow studies. 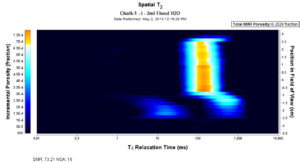 This cell was designed and built by the manufacturer of the GeoSpec product line, Oxford Instruments, so it allows the user to continue to utilize the high performance of the instrument while performing flow studies. When users are looking to pressurize the core, the P5 cell allows up to 5,000psi of confining pressure. This allows fluid to flow through the core sample at up to 5,000psi. These pressures are sufficient to replicate conditions found in most of today’s reservoirs. Following 7cc (1 pv) flood of brine. To find out more about flow studies and how our products and services can help, please contact us.